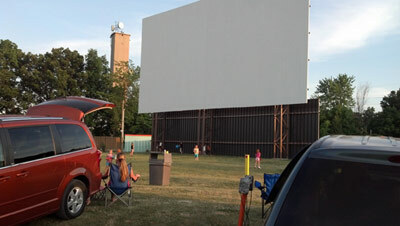 Last night the kids and I headed up to 49er Drive-in Theater on Calumet Ave. in Valparaiso to see the new Madagascar 3, which runs through June 15th at 49er. Perfect night for it! Men in Black 3 followed, but my kids are a little too young to make it that late of a night. If you have toddlers, you can try getting them to fall sleep on a blanket before the first movie is over and watch the 2nd in peace with your spouse! Make sure to bring bug spray, blankets and chairs. We&apos;ve been to 49er a number of times, and always have a good time. They&apos;ve been entertaining the community since 1956. The first movie starts at 8:30pm. Last night with it being premier night for Madagascar 3, it was packed! We arrived about 7:15 to get a spot closer to the front (it opens at 7pm). The kids have fun playing in the grassy area in front of the huge movie screen until the movie starts - you know it&apos;s about time when the Beep Beep song comes on the radios. Everyone there has always been very courteous of each other when we&apos;ve been there. Prices are pretty reasonable, too. Cost for adults is $8 each, kids 5-11 $4 and little ones 4 and under are free. They have great concession stand in the center of the lot with favorites like buttery popcorn, nachos, hot dogs, candy, onion rings, caramel apples, hot and cold drinks and now they even serve pizzas for the family. When was the last time you went to a drive-in?